Fr. John Prager returns to Ecuador! As I write this post Fr. John Prager is in the air returning to Quito, Ecuador, to resume his ministry among the Daughters of Charity. This was unthinkable seven months ago… even just seven weeks ago! The day before he left our provincial house in Germantown I asked him for his reflections about his extraordinary journey back to health and his expectations as he returns to the ministry he loves. His thoughts were centered on “How lucky I am!”. He knows that he has defied expectations at every step of the way. All he can think of is the many blessings from the prayers and support of his family, the Congregation of the Mission, the Daughters of Charity, his many friends and co-laborers. Their prayers guided the many medical professionals so instrumental in his recovery. Now with the clearance from many members of the medical community he returns to ministry in Ecuador. He has been told that escaped major damage to his heart. It is now functioning at near normal capacity for someone his age. The same for his pulmonary functions. After being released from Kindred Hospital in Philadelphia, at St. Catherine’s he worked at regaining a sense of balance that he lost from so many months on his back. He now functions at about 80% overall capacity. Above all, he is grateful for God’s special protection. At another level, he is also grateful that he was in a near comatose state during most of the long months of his recovery. The day before he left St. Catherine’s infirmary the confreres imparted a special blessing on him during Eucharist. He looks forward to returning to his duties Director of the Daughters of Charity. He describes these duties as primarily pastoral. This in contrast to another era where Directors exercised various forms of legislative authority. Since his term as Provincial of the Vincentians in Ecuador was coming to an end he resigned from this position. As he resumes responsibilities he will serve some 300 sisters distributed in 42 communities mostly in less densely populated areas than the two large cities of Quito and Guayaquil. Over the course of a year, he speaks with almost all 300 sisters, usually in the context of their annual retreat. REV. JOHN P. PRAGER, C.M. As an alum of St. John’s Prep (1955) the following story about the “Next Generation of the Vincentian Family” caught my eye for a number of reasons. “The Prep” was established in 1870 by the Vincentian Fathers as the Preparatory Department of St. John’s College (later University). The Junior Ladies of Charity stand in the tradition of Confraternities of Charity founded by Vincent 400 years ago and now known internationally as AIC. A project of the Junior Ladies to care for neighborhood trees coincided with the celebration of Earth Day and impacted the local community. St. John’s Prep Junior Ladies of Charity sponsored a two-day Tree Care Project. Fifty-five St.John’s Prep students joined alumna Nancy Perez ’86 and the NYC Parks Department in caring for trees in their Astoria community. After attending a talk and slide presentation by Ms. Perez, students planted trees, cleaned and mulched over 100 tree beds in a 5 block area around the Prep. The students were warmly cheered and thanked by neighbors. An ongoing project and partnership, the Prep welcomes the opportunity to be of service and to work to protect the environment. St. John’s remains committed to the Vincentian mission and to developing leaders committed to joyful service and social justice. “First and foremost, I would love it if this meeting could help to remind us that we all need each other, none of us is an island, an autonomous and independent ‘I,’ separated from the other, and we can only build the future by standing together, including everyone,” Francis said in a 17-minute video that premiered at the TED2017 conference in Vancouver, British Columbia. It was filmed at the Vatican and kept under wraps until April 25, TED said in a blog post. Pope Francis is the first pontiff to give a TED Talk. This year’s TED conference holds the theme “The Future You,” and is dedicated to addressing the pressing questions of our time. In his talk, which lasted 18 minutes and was filmed inside Vatican City, Pope Francis offered a response to today’s challenges, focusing on how to maintain an attitude of hope through solidarity with one another. TED is a nonprofit organization that hosts conferences around the globe, where many high-profile leaders give talks on a range of topics. This is the first time a pope has participated. “How wonderful would it be if solidarity, this beautiful and, at times, inconvenient word, were not simply reduced to social work, and became, instead, the default attitude in political, economic and scientific choices, as well as in the relationships among individuals, peoples and countries,” he said. “Only by educating people to a true solidarity will we be able to overcome the ‘culture of waste,’ which doesn’t concern only food and goods but, first and foremost, the people who are cast aside by our techno-economic systems which, without even realizing it, are now putting products at their core, instead of people,” he continued. Francis is no novice when it comes to using the Internet to spread his message. He has more than 30 million followers on Twitter, publishing short messages a few times each week in nine languages. Last year, he joined Instagram, gaining more than one million followers faster than any other person in the photo sharing platform’s history. While extolling the power of creativity in the realm of technology, Pope Francis also reminded those listening to his TED Talk to encounter one another in person. The pope told the story of the Good Samaritan and highlighted the example of Mother Teresa. He urged listeners not to give into doubts that they cannot meet such high standards. “Through the darkness of today’s conflicts, each and every one of us can become a bright candle, a reminder that light will overcome darkness, and never the other way around,” he said. The pope also called for a “revolution of tenderness,” repeating a phrase he has used often in his pontificate. He concluded by appealing to individuals to fight for change in the world. Today we observe the memorial of Translation of Relics of St. Vincent de Paul. “Translation” is a bit of jargon from our French roots. It refers to the solemn transfer (or “translation”) of the relics of Saint Vincent to their new home in the chapel of the mother house in Paris. For more history visit the Vincentian Encyclopedia. For history buffs, this article recounts the events that were described as one of the great public religious events of the decade. See also the Encyclopedia entry describing the intrigue required to preserve the relics and the role of the Daughters of Charity in hiding and safeguarding the relics. At the time of the French Revolution, Father Sicardi managed to hide the relics from the pillagers of Saint Lazare by remaining in the Sisters’ motherhouse the whole day of 13 July 1789. He returned to Saint Lazare from the Sisters when it was safe to begin to pick up the pieces. Since it was increasingly clear that the Congregation would be suppressed or at least moved from Saint Lazare, he joined Cayla and his fellow assistants in gradually preparing the remaining treasures of the Congregation for safe keeping. The relic of the heart of Saint Vincent was put in his charge sometime in 1790. He seems also to have been given the responsibility of guarding the Founder’s clothing as well as his personal items (breviary, walking stick and the like), a valuable painting of the saint and a collection of his writings. Someone, possibly Sicardi, developed a method to hide the relic: hollowing out the pages of a large book, volume two of François Giry’s Vie des Saints. When it was closed, it was just one of a number of books and other objects and gave no hint of its contents. Among the personal items Sicardi took is a manuscript of meditations for the annual eight-day retreat at Saint Lazare, copied by Cyr-Jacques Renaudon (b. 1695) in 1720. Sicardi’s name appears on the title page of his important witness to the piety of pre-Revolutionary French Vincentians. The plan developed to transfer these objects to the Vincentian house in Turin, which Sicardi knew well. He would be accompanied by two other Vincentians, Edward Ferris and Thomas-Félix Lebrun. Four Daughters of Charity would make up the rest of the traveling party, Sisters Colasson, Jolié, Lespinasse and Maltret, who wrote up an account of their adventures. This group of Sisters had been missioned to Hennebont but, when in 1791 they refused to take a prescribed oath, they left their house. According to Sister Maltret, “A cannon had been aimed at our door and the wick was lit” to force them out. After seeking refuge in other houses in Belle-Ile and Rennes, they arrived in Paris. Their new mission was to begin a house in Turin. The group of seven, all in lay clothing, left Paris 12 September 1792. Despite their secular dress, they were recognized one day in an inn and were in peril of their lives. Providentially, a general who had come to know the Vincentians during a retreat he made at Saint Lazare vouched for them and sent them safely on their way. Once arrived in Turin, the letters and the clothing were recognized officially, and the heart relic was exposed in the Vincentian chapel there. On one occasion, 17 July 1793, the relic was brought about in procession through the city to pray for rain, which subsequently fell in torrents. When Sicardi left for three months, he entrusted the precious relic again to the Daughters of Charity in the city. The reliquary apparently tipped over on the Sisters’ altar, and small fragments of the heart fell out. The Sisters gathered them up into four little reliquaries which Sicardi allowed the Sisters to retain. When, in 1796, the Sisters were forced to leave Turin for Vienna ahead of Napoleon’s troops, they had seals put on their relics to authenticate them. In 1800, the Vincentian house in Turin was suppressed, so Sicardi, still responsible for the now-reduced relic, brought it to his family and then deposited it with his confrere Georges-François Bertholdi (or Bertoldo) (1742-1804). He died only two months later but, fortunately, he had deposited it for safekeeping with an acquaintance whose name has not been recorded, and Sicardi was then able to recover it from him. In late 1804, Cardinal Fesch, archbishop of Lyons, learned of its existence probably while attending the coronation of his nephew, and he determined to ask for the heart for himself. In a few days, he decreed that the Turin Vincentians should hand it over to a French general, Jacques-François de Menou, sent to transfer it to France, along with the book in which it had been kept. The cardinal’s reasons were that he loved relics in the first place and that, since Paris had the body, so Lyons, where Vincent had been a pastor, should have his heart, before which Fesch would be able to pray. The transfer was more difficult and less complete than the cardinal imagined. One issue was the ownership of the relic. The archbishop of Turin wrote to Fesch declaring, incorrectly, that it was the property of the Vincentian house in Turin, having been given to them, and not just placed there on deposit by permission of the superior general. This would have made the transfer to Fesch more difficult. The cardinal would not be convinced and insisted that Menou take possession as quickly as possible. The Turin Vincentians, however, had their own plans and secretly excised two heart valves which they placed in another reliquary and which remain in Turin. The further diminished relic and reliquary were replaced in the book that had brought them to Turin, and arrived in Paris in May 1805, where they were authenticated in the presence of Brunet and Sister Deschaux, who had seen the heart exposed in Saint Lazare. Then the three items were brought to Lyons about 1 August 1805, and a solemn festival was organized on 29 September to welcome them to the cathedral where the reliquary was enshrined. The Daughters of Charity of Lyons received the large book, which is now kept at the rue du Bac in Paris. In 1814, when Hanon left prison, he tried to get the relic back. He queried Sicardi about it, and the latter explained that Cayla had left the heart with him not as a gift but as a deposit to be returned to the superior general once the Congregation had been restored in France. Hanon then went to Lyons with this document and talked with the vicar general, but its return was deemed impossible. Although a subsequent archbishop of Lyons eventually returned the heart to the Daughters of Charity, he placed the original reliquary in the diocesan museum, where it remains. [Fr. Tom Hynes Vocation story was originally scheduled to be published later this month. 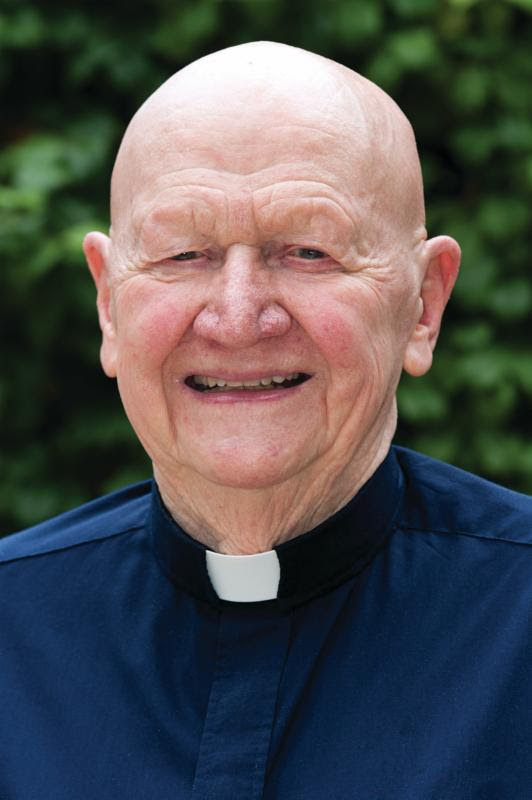 See earlier post for funeral details] Fr.Hynes was ordained to the priesthood on May 23, 1959. Below is his vocation story in his own words. Following that there is a summary of his ministries. It all began with a candle really two altar candles. As a boy in St. Cecilia’s Parish in Iselin, New Jersey, I wanted so badly to light those candles as I saw the altar server doing! My wish came true some years later when the pastor, Fr. William Brennan, decided to provide Mass for us parishioners from Colonia in our local library. After a stint in the Army when I was barely eighteen, my thinking gradually began to change. As a lowly private I served on Adak, one of the Aleutian Islands of Alaska, during the winter of 1946/47. That experience was a “rite of passage” into the real world of rough barracks life in a leftover Quonset hut from the recently terminated World War II. I knew soon enough that an army career was not for me. My sights were fixed on returning to college and becoming a journalist. But when discharge time came, there was no room left for veterans in the prestigious Rutgers University in New Jersey. I settled for St. Francis College in Loreto, Pennsylvania. There the Conventual Franciscans gave us young veterans a warm welcome to their campus. It was small. It was friendly. I felt quite at home going to daily Mass “with the guys” before breakfast. A decisive moment of grace came one day during German 101. Our text was “Das Lied von Bernadet” (“The Song of Bernadette”), a biography of the saint of Lourdes written in novel form of by Franz Werfel. As I translated from German to English Bernadette’s account of the apparitions, I realized for the first time in my life that Our Lady was not some plaster statue but a real, loving human being of flesh and blood, close to God and close to me. In her communion of love with Bernadette, Mary respected and smiled upon her. I knew after that experience things would not be the same. I began to pray more and to visit the large Lourdes grotto at the entrance of the college. Eventually I made it to Rutgers. Soon after my arrival, I noted that St. Peter’s Church was right across the street from the main entrance. It was there that I met my first Vincentian, Fr. Joe Illig, who was conducting a Miraculous Medal Novena. I had been thinking for months about becoming a priest but told absolutely no one. Fr. Illig was the first to hear and advised me to make an appointment to see Fr. William Brady at St. Joseph’s College in Princeton, New Jersey. 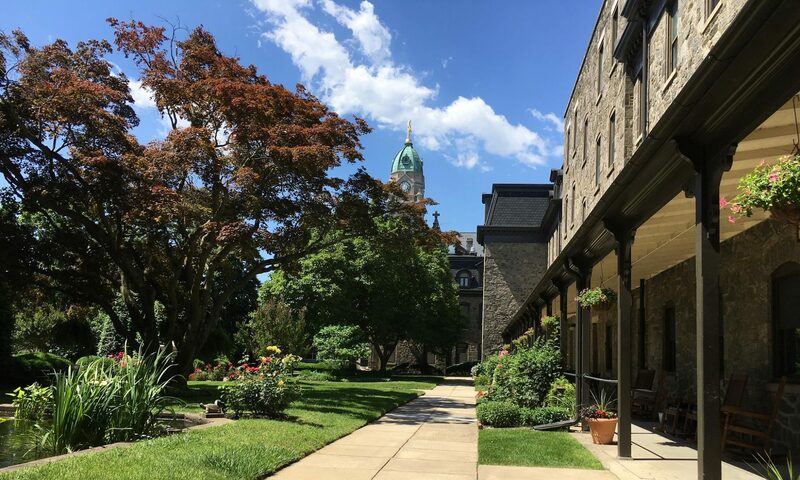 St. Joseph’s was the minor seminary of the Congregation founded by St. Vincent de Paul. Fr. Brady and I had a good talk together. Right off he made it clear that to be a priest in the Congregation of the Mission (Vincentian Fathers and Brothers) one had to be ready to make all the sacrifices necessary. I liked hearing that “straight.” It encouraged me to remain on the course I had chosen. Back at Rutgers, everything seemed to fall into place. My professor of Medieval Literature, William Hirten, who was a fine Catholic, agreed to teach me Latin without cost as a preparation for the seminary. All those in my family, still living in Colonia, were very supportive, especially my Dad. A few months after graduation I found myself at St. Joseph’s along with Jim Power and another young veteran. We were assigned to Fr. Brady’s “Special Latin” class. It served us very well in our courses in the major seminary at Northampton, PA. The year was 1950. I wish to offer her my thanks. And I hope that this testimony will encourage others to light their own candle as Vincentians. 1959 St. John’s Prep Religion Teacher, Study Math @Columbia U. 2012-17 St. Vincent’s Seminary Philadelphia General Ministry; Confessor at Miraculous Medal Shrine and Spanish translator for Monday Novena homilies. Fr. Callaghanhttps://files.acrobat.com/a/preview/772989ad-4a87-4dae-b4fd-e6839bd8ab60Germantown, Philadelphia, PA – March 30, 2017 – In commemoration of the 100th anniversary of the apparitions of Our Lady of Fatima, Fr. Michael Callaghan, CM, Associate Director of the Miraculous Medal Shrine, will speak on “Fatima and the Miraculous Medal: Prayer as the Power for Peace” May 13 at 7pm at the Miraculous Medal Shrine in Philadelphia. Fr. Callaghan’s talk will explore the connection between the two apparitions, which deliver important messages to humanity. Following Fr. Callaghan’s talk will be refreshments in the lower Shrine area; there is no cost to attend. In addition, attendees will have the opportunity to gain a plenary indulgence through veneration of an image of Our Lady of Fatima that day. Pope Francis has granted a plenary indulgence opportunity for the 100th anniversary of the Fatima apparitions from November 27, 2016 to November 26, 2017. In addition to venerating the image, conditions for obtaining the indulgence include: attendance of the talk, and praying the Our Father and the Creed, and invoking Our Lady of Fatima, as well as the usual requirements: sacramental confession, reception of Holy Communion, prayer for the intentions of the Holy Father, and complete detachment from all sin, even venial sin. Reception of a plenary indulgence grants the remission of all temporal punishment due to sin, and the faithful can obtain partial or plenary indulgences for themselves, or apply them to the deceased. Fr. Callaghan’s presentation is part of The Central Association of the Miraculous Medal’s Speaker Series, which presents noteworthy Catholic speakers throughout the year to inspire people in their Faith and in their Devotion to the Blessed Mother. One upcoming speaker will be Bill Donaghy, internationally known speaker for the Theology of the Body Institute, who will speak in September. For over 100 years, The Central Association of the Miraculous Medal (CAMM) has dedicated itself to spreading devotion to Mary Immaculate and her Miraculous Medal. CAMM also supports the formation and education of seminarians, provides care to the aged and infirm Priests and Brothers of the Vincentians’ Eastern Province, and supports programs that assist the poor. In commemoration of Earth Day, Niagara University announced today the establishment of two new bachelor’s degree programs in environmental science. The bachelor of arts program is a well-rounded curriculum, preparing students for jobs in the environmental industry, while the bachelor of science option is an excellent path for students interested in graduate programs in environmental biology and chemistry. The U.S. Bureau of Labor Statistics reports that the job market for environmental scientists and specialists is projected to grow 11 percent from 2014 to 2024, faster than the average for all occupations, due to increasing public interest in environmental hazards. Niagara University’s programs in environmental science will provide students with key elements from the natural sciences, along with critical research and thinking that allows for the review of environmental issues and demands. Through the programs, students will have the opportunity to review and analyze alternative energy systems, natural resource management, pollution control and mitigation, and the effects of climate change. Working in the state-of-the-art B. Thomas Golisano Center for Integrated Sciences, students will have access to cutting edge research facilities. Additionally, they will collaborate with faculty and students on research projects, as well as hands-on laboratory experiments and field experiences. For more information, please call 716.286.8250. Rev. Thomas J. Hynes, C.M. who you raised to priestly dignity in the priesthood of the apostles, may now be admitted into their company forever. Over the years, former Superior General Robert Maloney wrote often of Lent and Easter. This video presentation (click on the graphic) is based on two presentations from this collection. …like Mary the Mother of Jesus, focus on the word made flesh. He still lives among us, especially in the person of the poor. The test of our faith is to see him in the flesh. The first letter of John sets out a high standard for Christians: “Whoever does not love a brother or sister whom he has seen, cannot love God whom he does not see” (1 Jn 4:20) _ because God lives in the flesh. Seeing him in the flesh is the Vincentian secret of holiness. St. Vincent encourages us to recognize him and serve him in the most abandoned with practical, concrete charity. He urges us to be simple and humble before the poor person because he is the icon of the Lord, the body of Christ, the enfleshment of Jesus’ presence today. In some ways, at least it seems to me, it is more difficult to believe in God’s enfleshment than in his transcendence. It is easier to believe in a God whom we do not see than in a God whom we do see. It is easier to be caught up in a distant mystery than to come face to face with the revelation of God in human persons, especially when they suffer and die before our eyes. It is surely a challenge to see the Lord in the crucified peoples of Rwanda, Burundi, Algeria, Zaire, Albania, Serbia, Bulgaria, China _ to mention only a few of the countries where he suffers greatly in his members today. In almost all our countries, it is a daily challenge to recognize him in street people, in refugees, in AIDS victims, in disillusioned young people. “But turn the medal,” St. Vincent says to us, “and you will see by the light of faith that the Son of God, whose will it was to be poor, is represented to us by these creatures….” (SV XI, 32). This was also the same challenge Mary faced. Her contact with Jesus had numerous joys and privileged moments, as we recalled at Christmas. But she also witnessed his rejection, punishment, and dying _ and continued to believe. I urge you to share your faith in the enfleshed Lord this Lent by encouraging others _ especially young people _ to serve him in his suffering members. Let our Vincentian charism be contagious! Fr. Thomas Hynes went home to God at 6am this morning in St. Catherine’s Infirmary. Please pray for the repose of his soul. More details to follow.